At a recent meeting of the Board of Governors, Mr. Donald E. Simmonds was unanimously reappointed to a second 4-year term as Chancellor. 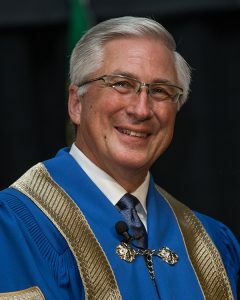 As the ceremonial head of the University, Simmonds serves as an ambassador and advisor and presides over the annual Convocation ceremonies. Mr. Simmonds is known as a “serial entrepreneur”, having been involved in over 25 new ventures primarily in the technology sector. Don is the Chairman and CEO of Blyth Group, a family office which invests in Health Care, Technology and Real Estate and offers Strategic Advisory services. Their newest venture known as “CitiIQ” has created a system that measures the health and wellbeing of a city and is used to support the development of strong communities throughout the world. He serves on a number of profit and not for profit boards. Don and his wife Fay live in Uxbridge, Ontario and have 4 adult children and 3 grandchildren. They have been deeply committed to the next generation, locally, regionally, and nationally with terms of leadership with Canadian Baptist youth, Youth Unlimited, and as the Canadian representative to the Baptist World Alliance Youth Department. Don has enjoyed coaching hockey for over 30 years and is head coach of the high school hockey team, the Uxbridge Tigers. As part of a community to community friendship, each year after Christmas Don takes a group of Tigers players and equipment to the remote indigenous community of North Caribou Lake where they conduct hockey clinics as a means of encouraging their children.